Emma Barker, course leader, introduces the PGCE. September 2015 saw the start of an exciting new era for the English and Media Centre as we launched our own PGCE course for Secondary English. The course was the first of its kind for EMC. Designed and delivered on the same principles as our CPD courses, it offers students a comprehensive training in all aspects of English teaching, as well as providing specialist workshops in media and drama. Alongside their school-based teaching practice, our students test pedagogical theory and research in practical workshop sessions at the Centre and our university partner, experiencing and reflecting as learners, as they develop as teachers. It’s the end of what’s been an exciting and absorbing first term of my PGCE. 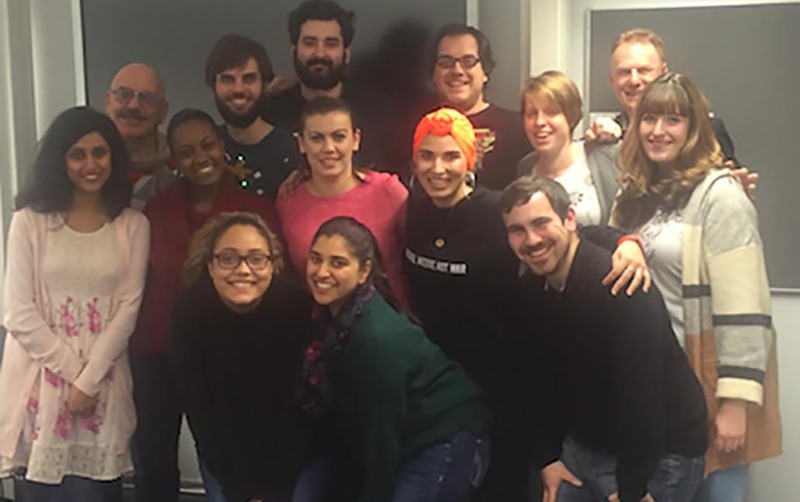 It began three and a half months ago with a flurry of engaging, energising and exhausting days at the EMC and London Met: three very intense but seemingly short weeks saw us doing all sorts of writing exercises, discussing poetry, making adverts. There was a (sometimes daunting, always interesting) steady flow of reading materials provoking new ideas, making us consider new perspectives. There were fantastic focus days on at the EMC with Globe performer Tom Davey and EMC media expert Jenny Grahame, and we spent an afternoon at the British Library. We team-taught our first lessons in a local secondary school. Our placements began, and it suddenly felt strange not to share a room with my fellow trainees and Emma each day. Soon school life grabbed us all up, but we’d see each other every Friday at lectures and excitedly talk over the week’s events. We’ve now all completed our first placement and are enjoying well-earned rests before it all starts again in January. Here’s to 2016! Read more about the students' reasons for choosing the course – and why they'd recommend it to others. We were delighted to be offered the opportunity to be partners with Goldsmiths for a new PGCE for Media Studies with English, which started in September 2015. The first cohort of 13 teachers are now out on their placements, returning to the centre on Fridays for Media sessions here. As many people will know, Media Studies teachers have often tended to be enthusiasts willing to have a go rather than specifically trained in the subject, so for the EMC it is really important that we are able to take the lead in the provision in this area. We had over 70 applicants for the first course, most of whom had a first degree in Media or a related area, as well as classroom experience, often as a TA or media technician; we are very confident that by the end of the year we will have a group absolutely ready to become the next generation of leading media teachers. In order to ensure that they are all in a position to apply for a range of jobs, as well as undertaking a long placement specialising in media, all the students will do a five week Key Stage 3 English placement at a second school. They also do two days a week at the start of the course at Goldsmiths being taught alongside the PGCE English students and a half day each week throughout the autumn term of professional studies along with PGCE students in all subjects. At EMC, the top floor has now been transformed into a flexible learning space with part of the area housing eight Macs, each equipped with Adobe Creative Suite; we have DSLR cameras and Zoom mics, giving the students the opportunity to undertake collaborative practical activities of the kind they would do in the classroom with students. We have also been able to run a number of twilight teachmeets up there in association with the Media Education Association, each featuring guest speakers and involving teachers from all over London. The enthusiasm for the whole course amongst the students has been infectious, as you can read for yourself here. From the very beginning of the course, my colleagues and I were thrown straight in at the deep end, taking on high paced activities that allowed us to explore Media Studies in depth. We have spent much time at EMC, which has been extremely beneficial. All of the equipment we have used has been top of the range, which we have access to throughout the week. Andrew, and all of the staff at EMC, the publishers of MediaMagazine, have also run sessions, giving invaluable advice as well as resources we could adapt and use in our own teaching. We have met other Media teachers as well as having talks from acclaimed writers and researchers such as: David Buckingham, Julian Sefton-Green, Julian McDougal and Jenny Grahame, media consultant at EMC. As a mature student, I was slightly hesitant before I decided to register for the course but I can say that signing up for the Media and English course is one of the best decisions I have made. We are privileged that the course is run out of the English and Media Centre in Islington. The facilities include a state of the art suite of iMacs, with all the equipment that one could wish for on a course that combines practical skills with relevant theory. The course leader is incredibly knowledgeable and passionate about media. The course has been fun and varied, the support has been second to none and I have made some great friends along the way. It's been fantastic working with EMC and they have provided a wealth of resources and tips that will help me with my teaching. We have been given all the advice and inspiration needed to go on to become top Media teachers. When making the decision to have a career change and to become a teacher, I was rather nervous. However, as soon as I started my PGCE with EMC, all my worries and fears went straight out of the window. We’ve been immersed in the world of media teaching, with practical sessions from the course leader and guest speakers on different aspects of Media Studies. The Media with English PGCE is one of the most challenging and rewarding academic years you could possibly undertake. Be prepared to work hard – this course isn't easy and you will be forced out of your comfort zone. But don’t worry either – the EMC instruction is well thought out, and the staff will provide a supportive working and learning environment for you (continuing to offer you plenty of support when you are out on placement). The first term is over and I couldn't have hoped for better support and guidance from my tutor, mentors and peers. It's been a truly enjoyable experience so far, even if the paperwork and teaching has been demanding. Completing the initial section of work has definitely been rewarding (and very satisfying!). Bring on the next term!